As many of you know, I am an aidworker. Since we started our “Change Starts Here” project about 18 months ago, many colleagues from work joined in, and became members of our Kiva lenders team. The news spread around, and quite a few people from work follow the project. While working on mission in the Dominican Republic for the Haiti earthquake relief operation, I had one of my colleagues come to me at the end of his mission. He said working in Santo Domingo and Haiti opened his eyes more, and he became more aware of what he could do in life, and for those around him. He asked if he could give me a -considerable- amount of money, part of his daily allotment for working here, so he could do some good through me. He wanted to remain anonymous, but still wanted to contribute. So the loans I allocated today are his “giving back” to the world, a world he felt now much more part of. I was taken by this gesture, as it illustrates how ‘doing good, spins off’, but also towards him, I said “Do good, and good will come to you”. Thanks again, my anonymous friend! May the good come to you too! 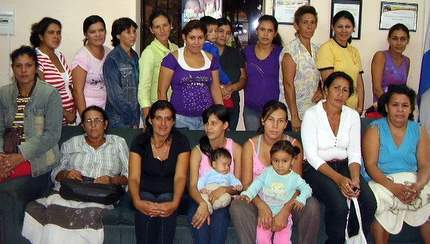 Your loans were allocated to agricultural entrepreneurs in South America, like the Santa Lucia Communal Bank entrepreneurs, consisting of 18 women. They are all friends and neighbors and are working in their fifth loan cycle. Justina, the team leader, requested a loan to establish a business selling slaughtered chickens. At first she will sell to the neighborhood businesses. Then, she wants to have her own henhouse to raise, fatten, and sell the chicken herself. This will leave her with greater income. As I have been in the Dominican Republic since January, supporting the Haiti earthquake emergency, I thought to concentrate my next batch of loans to entrepreneurs in this region. I found a few of them based in the Dominican itself, like the Unidos Venceremos group in Samana, bit further North from here. Martina is the coordinator of the group. She lives with her partner and their three children. This is her nineth loan with Kiva. She plans to use this loan to invest in her business by traveling to the capital to purchase skirts, jeans, blouses and pants in the main markets and then bringing them back to her community to sell. She will use the profits to invest in her business by purchasing a scooter to help her move her merchandise as well as saving towards having her own store one day (her current business is mobile). She also wants to invest in her home by remodeling it. As I have been busy with work, repayments from previous loans had been piling up on my Kiva credit, to a total of US$3,500. So after I “exhausted” the loans for Dominican entrepreneurs, I looked for more entrepreneurs from South America. Why? Well, during my stay here, we had many South American staff from our organisation travelling through, and working with us. While I travelled through over 100 countries in the world, South America clearly showed to be an unknown to me. I was surprised to find so many of these people well-trained, very motivated and knowledgable, and I have started to grow fond of them. That’s why the majority of the funds for this US$3,500 loan went to entrepreneurs in this region. As they deserve all the stimuli they can get. Copyright © 2019 Have Impact ! - You can reuse this content for non-commercial purposes as long as you link back.